Merisiel had a shady past but reformed (somewhat) and used her skills as a thief to aid her allies in exploring the wonders of Golarion. It was a surprise then when her allies learned that Merisiel was part of the villainous council that ruled the city of Shareen, which lay at the heart of the prison dimension known as The Worldscape. Here now is the untold tale of how Merisiel found herself fighting alongside the dark wizard Kulan Gath, the sky-pirate Phondari and the Empress Camilla! 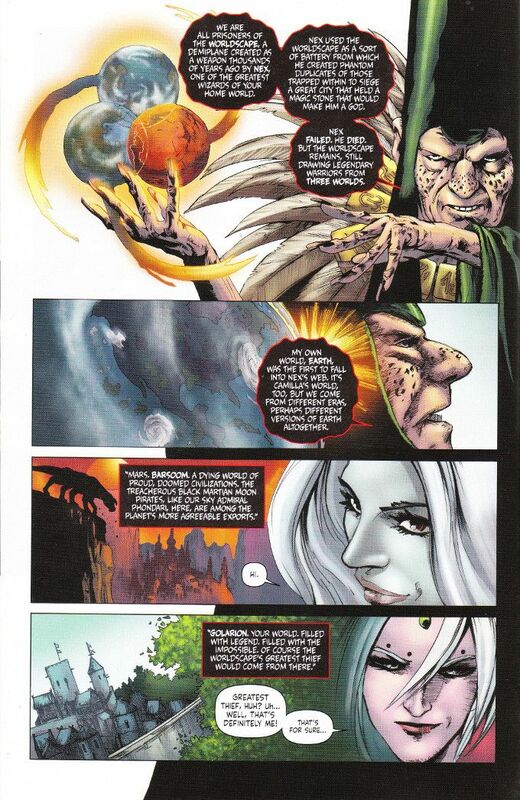 The plot thickens in this time-twisted issue of Pathfinder: Worldscape, though the actual story doesn't advance much. Despite this, the story at hand is a wonderful character study of Merisiel. And the artwork by Jonathan Lau and Omi Remalante continues to impress.